You probably think the Tesla Model S P100D is quite a fast car, and that’s for a good reason: It is quite a fast car. It accelerates faster than gravity, if you want to get specific. But the racing spec of the car is even faster, with 778 horsepower and a 0-to-60 time of two seconds flat. Get the Dramamine. The Model S time is nearly half a second faster than the Porsche 918 Spyder, even if 0-to-60 times don’t tell all and they’re kind of gimmicky. But hey, this thing is fast! According to CarScoops, the race car and all of its specs made their debut at the Autosport International show in England on Thursday. 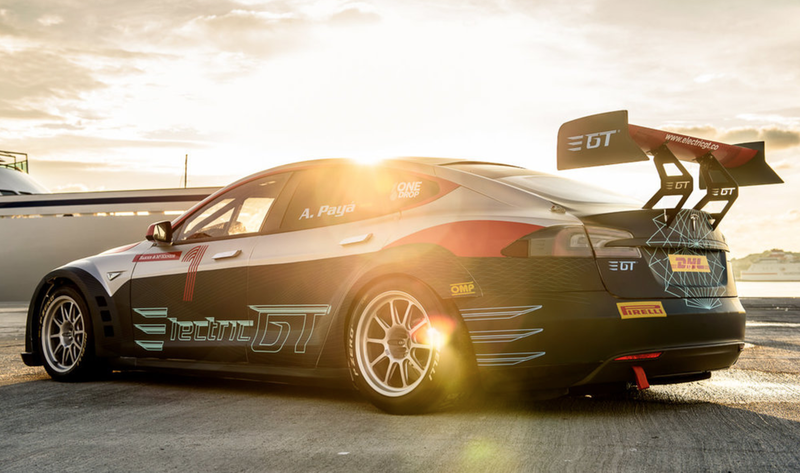 The Model S P100D-based car will race in the Electric GT Championship spec series, which means that all of the race cars will be identical. Despite the crazy 0-to-60 time and the high horsepower, this isn’t a car built specifically for the race track. According to Motor Authority, the spec racers are just regular Model S cars that have been modified. Among the modifications are a removal of around 1,100 pounds from the curb weight, as well as a boost to 778 HP and 734 lb-ft of torque. The series will launch on the island of Ibiza on Sept. 27, and will have 20 drivers on 10 different teams—just like the electric FIA Formula E Championship. Motor Authority reports that the season will be seven rounds, with each having a day race and a dusk race. There will also be three non-competition events, according to Motor Authority. Sounds like a pretty flexible commitment. As of September 2016, the series was looking for drivers. Think you’re up to it?